Posted April 9th, 2012 by Ryan & filed under Programming. Updating the available pre-release version of ProofBuddy was on my to do list last weekend. A few months ago I wrote a script that pulls a specified version from a subversion tag and packages it up. For the last couple of weeks I’ve been sitting on a beta version to give testers a chance to report any bugs; and since there haven’t been any new reports it was time to update. 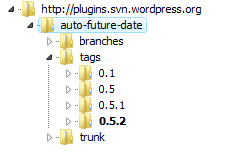 But it’s been a while since I updated the beta and I needed to make sure that the trunk hadn’t been changed. Fortunately, TortoiseSVN has something built in to do just that. First thing, open up the repo browser and right click on one of the folders you want to compare. From the pop up menu select Mark for Comparison. The selected folder will highlight in bold. 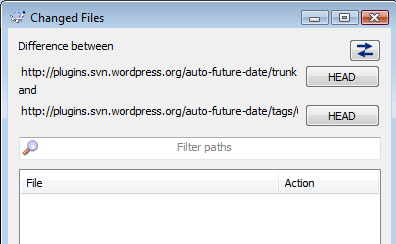 Next right click on the other folder and select Compare URLs. You’ll see the following page, hopefully empty like what I saw. If there are any difference they’ll be listed in the list box. Thanks to this post at the TortoiseSVN site it was a quick check.